After the 2018 election, constitutionally we seated newly elected and re-elected officials at the local, state and national level. You can always KNOW when a politician is dealing with a very hot political issue with two key sentences: Let the People Vote and I am personally opposed, But! This is a true litmus test for average citizens to identify authentic leadership versus followers who are shamelessly being led around with a ring in their nose by well-funded lobbyist. They are also covered with fig leaves. Let me explain. In Genesis, one of the earliest bible stories we all remember, on the sixth day God created man and woman. God’s one and only restriction on Adam and Eve is that they not eat of the forbidden fruit from the tree of knowledge and good. After they had sinned against God, they felt naked and covered their private parts with fig leaves. I am hopeful in this article to remove the fig leaves to identify a follower and also admonish the signs of true leadership. The first fig leaf sign of weakness, and a sure-fire way to know you are dealing with a follower is the sentence: “Let the People Vote.” People like the notion of voting, because they distrust double talk from politicians. Generally, this phrase is used over a constitutional amendment. This sentence coming from the mouth of an elected official is an immediate indication this is a very tough issue and the elected official does not want to get scorched by taking a clear position. Facts versus polling data can sometimes be polarizing. Legislators are often given hard facts on an issue during the public hearings and debates. Those who have much to gain economically will always showcase a snapshot of early polling data from a constituency who has not yet been well informed on the topic; but it just sounds good. Do you want your government run by polls or hard facts and historical data? A legislator should not hide behind the fig leaf; “Let the People Vote,” but publicly declare with their position with procedural votes; is this Good Public Policy or Bad Public Policy? After vigorous debate, a house member or senator will vote yes or no. If 2/3’s of the house and senate bodies vote yes, the Alabama constitution guarantees citizens the right to vote on that issue, NOT A LEGISLATOR. For example, every year the legislature is tempted to take up the debate of legalizing a lottery and they make it sound as though it goes straight to the people for a vote; hang on a minute! A legislator can Vote Yes or No up to four times on any one given bill. The first vote is the Budget Isolation Resolution allowing it to come up ahead of the constitutional mandated budgets, which are supposed to be first. If they are in the committee, there is a vote, then if there is a debate a cloture vote and then final passage. Also, if there are amendments along the way here are some more votes. There are plenty of opportunities for a legislator to Vote Yes or No. Bottom line; they are voting yes or no on one simple question: Is this good or bad public policy? The other famous sentence of a follower is: “I am personally opposed BUT…. It is a crafty old trick in the playbook of the follower. Usually Democrats use this term, but some Republicans have borrowed that slogan. I am personally pro-life, but I think a woman has a right to choose. I am personally opposed to this Gas Tax increase…BUT my lobbyist who funded my campaign wants the tax. I am personally opposed to transgender bathrooms, but the people should choose what bathroom they use. This is not a sign of leadership, this is evidence you are dealing with a fainthearted DNA unable to take a position on an issue. I AM personally opposed, BUT!!! Actually this is a double talk position, which actually alienates the public official from both sides: take a position please. My former boss, Governor Fob James told me one time; “Giles if you give the people ALL of the facts, they make right decisions”, and he is right. For example, early polling data in 1999, suggested the people that supported a lottery was north of 60%; but when given the facts like mentioned in the above paragraph; like Governor James profoundly spoke, 54% of the state voted against a lottery. True leadership on the other hand, gathers all the facts and takes a position even on the tough issues and the hell with the consequences. Leadership is often lonely, but true leaders understand that one is a majority. Anyone can pick up the talking points of CNN or other opinion leaders; but a true leader makes sound decisions even when unpopular based on a solid foundation of hard facts and data. A true leader will die for what they know is right; a follower will run and find a fig tree. Listen closely; is your legislator standing with a fig leaf or are they facing Goliath alone with a sling and five stones. 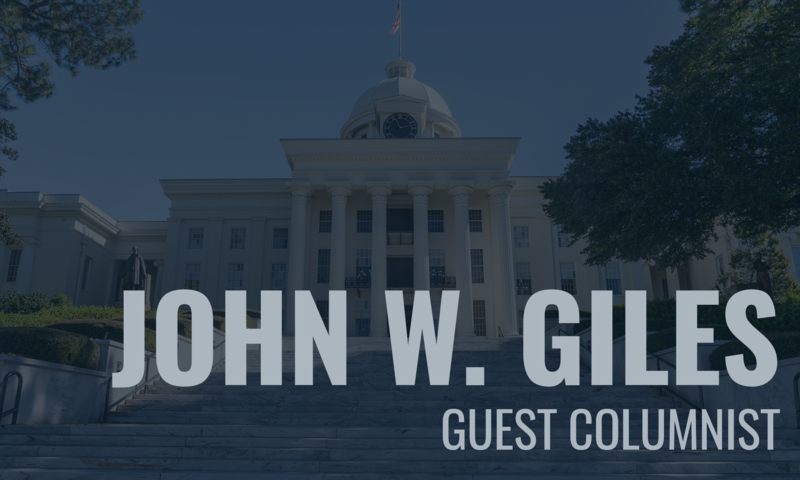 John W. Giles is former President of the Christian Coalition of Alabama. He served as Small Business Advocate for the State of Alabama during Governor Guy Hunt's Administration. He was also a member of Governor Fob James Cabinet.